Red (shown) is employing the infamous Skippy's Demise strategy, in which most of the stronger units are pointlessly sacrificed while holding the weakest units in reserve, as to lull the opponent into a sincere sense of security. 1 What is a Stratego? 1.1 But why does this appeal to the Hebrews? 3.2 Hey, look over there! <section begin=fatext2 /> Imagine chess. There are differently ranked pieces, each one more dangerous than the last. Now, imagine a game almost entirely different from chess, where you have twice as many pieces, most of which can only move one space at a time. Additionally, you can arrange said pieces in any way you want. Plus, there are two lakes in the middle of the board. Voila, Stratego. Further demographical research has proven that, though the blind are dedicated fans of the game, the deaf don't really care and would rather go for a walk. The mute have yet to comment on the issue. The red Marshal, seen here sacrificing his opponent to the Stratego Gods. That's what he gets for peeking! 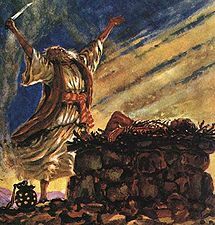 But why does this appeal to the Hebrews? In traditional Stratego, ranks go from right to left, with 1 being the strongest and 9 being the weakest, making the game numerologically accessible to those of Jewish origin. Also, the Marshal unit bears a striking resemblance to Abraham. Whatever the reason may be, Stratego has a massive following amongst Jewish players. The national Stratego Championship is held at the Super Strategogogue, the "Stratego Superdome of Synagogues," in Williamsburg, Brooklyn; it typically opens with a ceremonial shofar-blowing and overlong speech by the Executive Stratego Inquisitor, who is usually also a rabbi in the area. Stratego Championship season also heralds in a massive country-wide increase in gelt sales and reckless gambling, the third largest annually apart from Hanukkah and Mel Brooks's birthday. Each one of Stratego's pieces were virtually identical on every plane except for power and image, so it was the Stratego player's perogative to develop complex mythologies about the pieces in order to keep them interesting. This changed in 1988, when the High Council of Standards and Practices determined that minor additions needed to be made to each unit, as players' imaginations would often run away and interfere with tournament play. The Scout (8 in quantity; 9 in rank) is aptly also know as That Other Little Bugger by both employers of the unit and sufferers of its attacks. Much like the spy, it dies when attacked by anything, but is the only unit whose movement is not limited to a single space at a time. This bonus has made positioning scouts at the front lines for early reconnaissance logical, but overuse has led to questionable, yet predictable, results. Every miner goes through intense training for their special task: safely defusing bombs. With this task, they are given a pair of scissors and months of finger exercises to perfectly cut the Bomb's ever-running fuse. No other unit can do the same, as they lack the necessary scissors and finger training, and thusly die a horrible, fiery death. Despite this advantage, the scissors remain the Miner's only weapon, so the only things besides bombs they can destroy are the feathery hats of the scouts and stringy underpants of the spy. The Sergeant (4 in quantity; 7 in rank) is one of the guys in the middle with no purpose but taking up space. Plain and simple, the Sergeant can be killed by anyone bigger than him, yet few units are weaker than him; in addition, he has no special powers whatsoever. In short, the Sergeant is useful for blocking the path when you need to get your more powerful units to the front lines. This talented lack of specific talent has led to its fitting reputation as mere filler. The Lieutenant (4 in quantity; 6 in rank) is the other guy in the middle with no purpose but taking up space. Plain and simple, the Lieutenant can be killed by anyone bigger than him, yet few units are weaker than him; in addition, he has no special powers whatsoever. In short, the Lieutenant is useful for blocking the path when you need to get your more powerful units to the front lines. This talented lack of specific talent has led to its fitting reputation as mere filler. The Captain (4 in quantity; 5 in rank) is the third guy in the middle with no purpose but taking up space. Plain and simple, the Captain yada yada yada mere filler. Next? The Major (3 in quantity; 4 in rank) is a rather dull piece of plastic. He has a boring hat, a hackneyed name, and is little more useful than the captain. It has caused no controversy, is capable of no epic moves, and no one mourns it when it dies. In short, it's the equivalent of a fire hydrant. Seriously, just look at that hat. It's just so god— wait, is that William Riker? 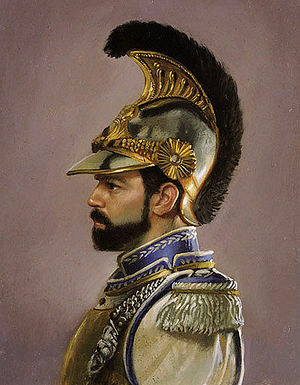 The Colonel (2 in quantity; 3 in rank) is widely hailed to be the most awesome unit in the game, partially due to its ability to kill nearly everything while still being moderately available, yet mostly because of the bitchin' headdress he wears. The greatness of said headdress has had such influence that some theorists suggest that the Andrew Lloyd Webber Broadway play Jehoshaphat and the Awesome Technicolor Headdress, and to an extent, the NBC peacock itself. The General (1 in quantity, 2 in rank) draws his immense strength from a deep well of scathing insults and Freudian insecurity. He is blind to the opinions of others and falls back on circular logic when a lesser unit tries to strike back at his deadly verbal barrage. Thanks to these skills, the General was appointed as a Conservapedia admin in 2008. The only units which are safe from his bigoted Intranetus Bigmanus flames are the notoriously stone-faced Marshal and the notoriously inanimate Bomb. The Marshal (1 in quantity, 1 in rank) is the grand mac daddy of all Stratego pieces. His emerald pimp cane can lay the smack down on all opponents but the bomb, and his presence in an enemy's base has been known to degrade morale as much as seventy nine percent. He's the Grand Moff, the judge jury and lord high executioner. The Marshal's only weak spot is in the small of his back, which the spy can reach by throwing a razor-lined monocle at it. Alternately, the Bomb has also been known to reach the small of the Marshal's back by means of blowing up the rest of the body. The Bomb (6 in quantity, 3/5ths in rank) is the token black unit in Stratego. 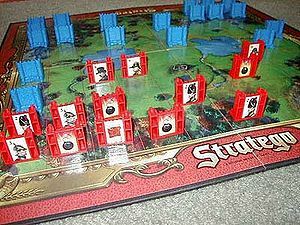 Because of Stratego's Eurocentric and predominantly white fan base, the Bomb is given very few rights in the game; it is the only piece which doesn't have the right to move, yet it is dangerous enough to brutally kill any other unit with it's supply of "gats" and "cap-guns" believed to be stored inside its casing. Only the Miner can safely defuse the bomb, a skill known around Stratego circles as the "White Unit's Burden". The Flag isn't important. Just place it anywhere, it's only a piece of cloth. Each unit's rank is immutable and enables it to ruthlessly murder any unit of a lower rank. However, the Grand Stratego Charter is noticeably dodgy regarding units of equal rank attacking each other. The High Council of Standards and Practices took a stand on the issue after parsing and interpreting the Charter for several weeks in 1994, ruling that players in competition should "just do what they see fit to do." This ruling has tore a sea of new potential strategical vistas wide open. Remember, it's not a bomb until your opponent finds out himself! 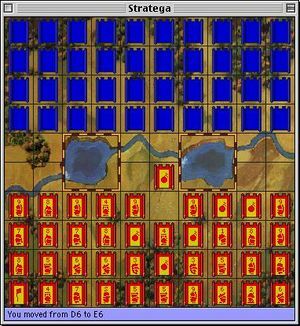 Stratego, much like Chinese Checkers and Age of Empires, requires a minimal amount of strategy and tons of cheats in order to secure victory. Many Stratego professionals openly admit to cheating as many as twenty times in a single half hour match. On June 12th, 1996, one player in Idaho started a petition to have the name of the game formally changed to Cheatego, but the High Council of Standards and Practices thought the relabeling would detract from the ostensible strategy element of the game. The petition was rejected as bupkes and the yearly Stratego Championship continued on unrenamed. Despite the abundance of cozening, there are still legitimate way(s) to gain an advantage over your opponent. This is by far the most efficient defensive strategy. Simply put, just put all your bombs at the front lines. You won't be able to move, but your enemy is forced to send waves of enemies at your bombs just to get enough pieces out of the way so they can get their miners to the front. Win-win situation! Of course, this isn't exactly a legitimate strategy. So what? If your opponent gets suspicious after the first ten or twenty turns you pass, just move one of the bombs back and forth. What's the harm done, he's already wasted all his units. Now, when it comes to capturing the flag with all those bombs in the front row, the next strategy comes in handy. Employing this strategy requires quick hands, fast eyes, and some sort of distraction. Most pros recommend the use of the Aurora Borealis as the distraction for optimal results, but its rarity often leads to two players discovered playing in the frozen wastelands of Alaska, fully frozen. The strategy itself is simple, albeit difficult to accomplish: One player distracts the other, and using his/her quick eyes and hands, takes a look at as many of his/her opponent's pieces as time allows. A variation of this strategy has the employer switch his units around when the mark's back is turn. Okay, so this is actually cheating, what are you going to do about it? There just aren't that many Stratego strategies, unless you count "blindly try to kill the invisible enemy" or "guess what unit that is" as tactics. 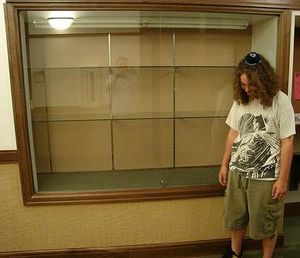 Though he never became champion, Stratego finalist Malachi Chutzpah holds the record for "Most successful distraction". Playing as Red, he crafted an elegant scheme before the game to distract his opponent long enough to get a good look at every one of his pieces; oddly enough, his plan worked. "It was easy to do. I simply murdered his wife, and delivered her head in a box to the Super Strategogogue on the day of the match. Once he opened the box, I had plenty of time to check out his pieces," said Chutzpah a year after his championship match, from his maximum security jail cell. This go-to strategy for Jewish Stratego aficionados doesn't contribute much during gameplay, but works excellently as a defensive contingency. Prior to the first move, the player replaces his flag with a blank piece, wraps the flag in a sacred napkin, and hides it under a couch. If the tide turns against him during the endgame, he reveals that he never had a flag in the first place, making him invincible. This move is countered by the opponent's children, who can be easily bribed to go searching for the hidden piece. The Stratego Hall of Fame, with curator Moshe Abramoztein. ↑ The 2002 Stratego Championship ended in a forfeit after a bloody fistfight between two blind contenders fighting over a salted bagel and lox. ↑ The 2005 Stratego Championship was called off after a bad-taste joke by finalist Harold Bloomstein insulted every judge in the room. "I've diversified my mazel tonight," said Harold, "so even if I lose the game, I'll make it up when Mel dies!" ↑ This change was spurred by the 1987 Stratego Championship, which ended in a draw when all of the units in play spontaneously turned into man-eating dragons. ↑ The 2004 Stratego Championship ultimately ended with a forfeit, as well. This was due to a red scout capturing a blue spy on the first move and the bloody fistfight that followed. ↑ This special ability caused confusion during the 2003 Stratego Championship, when Red surrounded most of his miners with bombs to preserve them until they were needed, not knowing they could only defuse enemy bombs. The game was called a draw when Red got Blue down to just the flag, but couldn't defuse the bombs surrounding it to win, seeing as the defusers were stuck in his own base. ↑ The 2010 Stratego Championship closed in a draw when both players were too apathetic to capture each other's flags with their remaining majors. ↑ The 1998 Stratego Championship ended when both Red and Blue were decimated down to only their colonels. In an effort to save plumage, they both agreed to call it a draw. ↑ The 1997 Stratego Championship ended in a draw when both sides reduced each other to naught but bombs. When a person in the audience requested that one of the bombs simply just move, Red responded curtly with "Nobody likes an uppity IED!" This phrase launched the entire Super Strategogogue into a riot, in which both contenders were slain. ↑ Though the Stratego Championship was prematurely closed in 1994 after Red decided to tear Blue a new vista after their two marshals came into conflict and neither could decide on a satisfactory resolution. ↑ Though, as usual, it ended in a draw. The reason? Flu outbreak. ↑ As was the case of the 2001 Stratego Championship. This, of course, counted as a draw. ↑ Chutzpah's Stratego Championship match in 2000 ended with both players involuntarily forfeiting thanks to his patented maneuver (the eponymous Dirty Chutzpah). ↑ The 2006 Stratego Championship was ruined when challenger Leonard Isaac Jacob Benjamin Greenberg attempted a counter-counter by putting the flag in his pocket and hiding a small explosive device in the couch instead. Luckily, his opponent didn't have any children, and didn't mind much that he didn't have to deal with his annoying nephew anymore. This page was last edited on 29 May 2012, at 05:48.